Upcoming Concerts | A Tempo! Cinderella wants to go to the ball; Jack wants to climb the beanstalk; Little Red Riding Hood wants to take some goodies to her grandmother; Rapunzel is stuck in a tower. Add to these popular fairy tales one more about a baker, his wife, and the witch next door, weave them all together, and you have the ingenious mashup otherwise known as Stephen Sondheim and James Lapine’s Into the Woods. From February 21st through 24th, 2019, University Theatre and University Opera, in partnership with the Wisconsin Union Theater, will co-present Into the Woods at Shannon Hall in the Memorial Union, marking the first time in twelve years that the Mead Witter School of Music and the Department of Theatre and Drama have collaborated on a production. David Ronis, Karen K. Bishop director of opera, will direct, and Chad Hutchinson, orchestra director, will conduct. 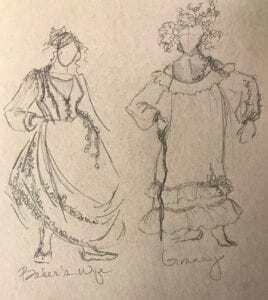 Into the Woods costume design for Granny and the Baker’s Wife, by Ashley Bellet. University Opera is a cultural service of the Mead Witter School of Music at the University of Wisconsin-Madison whose mission is to provide comprehensive operatic training and performance opportunities for our students and operatic programming to the community. For more information, please contact opera@music.wisc.edu. Or visit the School of Music’s web site at music.wisc.edu.